The Guardian today reported on Facebook’s scandalous manipulation of hundreds of thousands of users’ emotions as part of an experiment. Needless to say, there has been an uproar – and rightly so. Just the lack of informed consent – or is that in the small print somewhere? 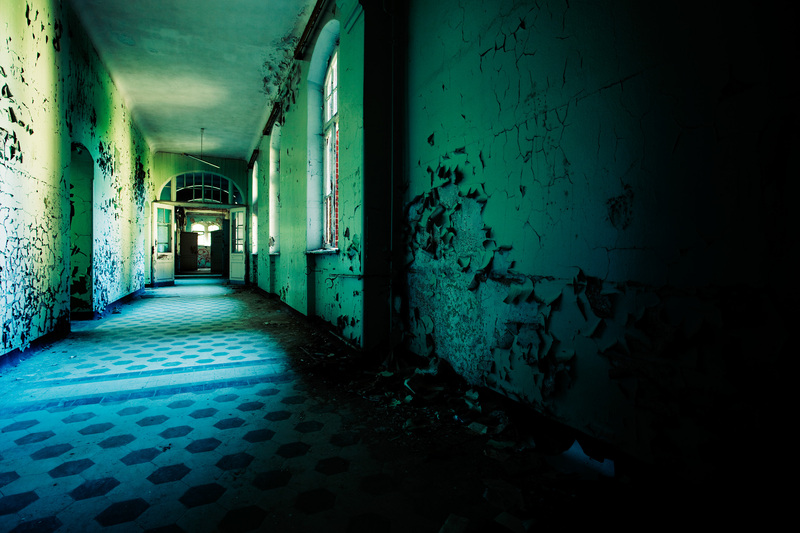 – makes the flesh crawl. It would be interesting to know how they measured the emotions they manipulated – entirely by the ‘how are you feeling’ function of a status update or by something more subtle? Will the results eventually be published? Will those people so manipulated be, after the fact, informed of their participation. Another salient point, I think, is that this kind of experiment is entirely unnecessary – countless prior experiments into emotional contagion have been undertaken and, while certainly not in this medium or on this scale, the results are, predictably, the same. This is my first crack at writing New Media fiction / digital fiction / hypertext fiction / hyperlink fiction or whatever you choose to call it. I used Wix.com to create it. Now this is exciting and different – a war with (as yet) no blood spilt. Everyone should read this article in the Guardian today if they want a clue as to how the world is turning in the twenty-first century. To anyone who was in any doubt that the events depicted in William Gibson’s Neuromancer and Neal Stephenson’s Snow Crash could ever happen, think again. The collaborative online events sparked by the Wikileaks/US cables controversy read like science fiction and as yet the trajectory of these happenings remains unclear and —unfortunately for those who would silence the leaks— uncontrollable. 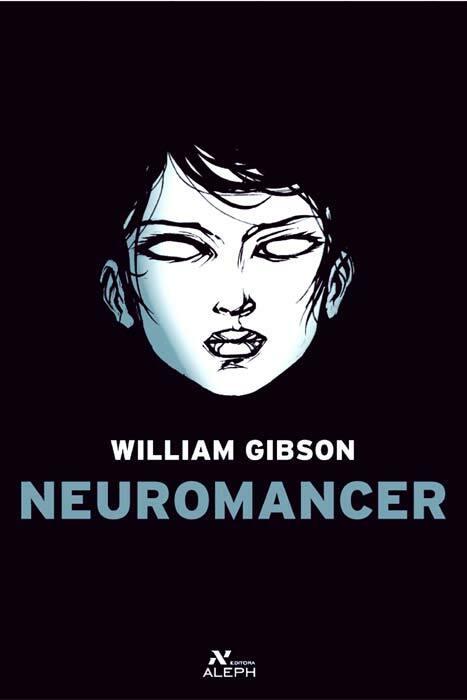 Donna Haraway, whose Cyborg Manifesto (1991:2) posited that the ‘cyborg is a creature in a post-gender world’, also claimed that Neuromancer offers a radical critique of current gender roles. In arguing where Gibson is implicitly criticising, accepting or ambivalent in this respect, this essay will examine his representation of men and women and search for underlying bias in the characters’ descriptions and fates and their adherence or subversion of the gender roles assigned them. Case is a traditional —if unwholesome— [anti-]hero that Gibson wants us to like. Someone who has paid harshly for a mistake, Case’s killing of three people in Chiba is glossed over as part of his downward spiral and not dwelt on. It is in relation to Molly, however, that differences emerge. In a reversal of traditional roles, Case is the passive, non-violent, controlled one, though he has to ‘will himself to passivity’ (p.72) to receive Molly’s simstim sensorium. Despite the contention that Molly is just a vehicle for him (Stockton, 1995), Gibson portrays the power and control as belonging to her. The few named female characters include Molly, Linda Lee, 3Jane, Marlene, Michèle and (Flanagan, 2000) the Matrix itself. Women are depicted as sexual objects, from the ‘free’ Linda Lee and Molly to the ‘forced’ wives of the sarariman, who are required to wear sackcloth and sport artificial bruises (p.154) and the meat puppets who endure sexual (ab)use, though technology can cancel-out their conscious awareness of it. Molly’s recollections of her ordeals are possibly a reminder that no matter how they try to fix it, actions such as these always leave a mark somewhere. Conversely, the reader is meant to like Molly. She is portrayed as good, strong and independent. She is not a sexual trophy for Case, she is his bodyguard. This is a major contravention of the protection and safety role that men traditionally occupied in relation to women. Molly is the one who initiates the first sexual encounter with Case and in another transgression of generally accepted gender roles, it is Molly who leaves Case at the end of the novel. She would not have the ability to truly break away from the female stereotype, however, without her body’s enhancements. To become a street samurai, a ‘working girl’ (p.41) she first had to be another kind of working girl, a meat puppet, in order to be able to afford the expensive surgery (Cavallaro, 2000). Molly sacrifices and utilizes her body in order to attain the power and status generally afforded only to men. This kind of trade-off had been the norm for decades at the time Gibson was writing. All of these factors seem to suggest that Molly is a strong new type of woman, however she can be perceived as a cautionary tale, i.e. be like her and become isolated. Therefore, although Gibson seems to be criticising women’s various sexual or abused roles and celebrating their liberation from them, he nonetheless includes a corollary. Overall, Gibson seems to criticise current roles such as the militaristic macho man and the sexually abused woman and encourages subversion in liked characters, i.e. Molly and Case. However, subversive but unliked characters are punished and as Kamioka notes, even though Gibson ‘hates’ the status quo, ‘his balancing act accepts [it] … as inevitable and unchangeable.’ (Suvin 1991 in Kamioka, 1998:65). The Times is aimed at the market sector ABC1 age 25-44. This is supported online by the homepage job advertisements for £32,000-£100,000pa managerial staff. Giddings’ (2009) study showed The Times’ news agenda to be focused on business and politics unless breaking news presents itself that is of a different nature, e.g. war developments and natural disasters. On his website, Jakob Nielsen describes 113 homepage design guidelines, similarly Vincent Flanders‘ website proffers two checklists; the first containing 149 ‘mortal sins in website design’ and the second 82 ‘potential mortal sins’. These, among other experts, will inform the analysis of The Times Online. TOL is the first result on Google, Metacrawler etc when entering the terms ‘times online’ or just ‘times’, but is only the twelfth Google entry when searching for ‘business news’, which could be detrimental in terms of readership volume. The site is also amenable to ‘spiders’ such as Google’s. Intrasite searchability is good as TOL has a search engine in the same place on every single page and the text inside it scrolls to allow the user to see what they are writing. The exception here is the inability to view (e.g.) yesterday’s edition as a whole. TOL appears technically stable and crash free. Items are quick to upload (average two seconds). All tested hyperlinks worked and no dead links/404 pages were encountered within the site. Loading time for video and audio were both within a few seconds and videos have to be activated by the user, they do not just start playing automatically. Videos are primarily and secondarily sourced. Video loading/buffering/playability/audio&visual quality are all very good (where primarily sourced). Two exceptions to functionality were found. Firstly, the hotels review map is overlaid by the central column of text, making both illegible. Secondly, toolbar for the archive viewer (which displays manoeuvrable GIF files) did not work on repeated testing. The site is overall easy to get around and full of useful links, though navigation is mainly rooted at top tabs, with other links spread throughout the rest of pages. Sometimes the latter are relevant to the main article, sometimes not, but perhaps this incongruity is part of what gives TOL its stickiness —and stickiness is what any website needs to achieve. Generally, it takes the minimum number of clicks to get where you want to be, there are neither too many hyperlinks nor any Mystery Meat Navigation, though the fact that links do not change colour once they have been visited is potentially disorientating. The suggested action is fruitless and TOL’s attempts to redress this situation have apparently been underway for 18 months, but the Webmaster has neglected to update this notice. Presented in a functional and pleasant colour scheme, TOL essentially has the same 3-column design format throughout though these columns do not finish at the same level. Well-timed rolling headlines relevant to selected top-bar category are at the top right of the page —albeit in the same font as body text— and top stories are easily identified. There are no background graphics, the contrast is totally readable and there is no underlined text that is not a hyperlink, though the reverse is not true. There are too many pictures, the colours of which sometimes clash with each other, adverts often flash distractingly and are sometimes garish, though their content is relevant to TOL’s target audience. While not too packed in and indeed spacious in smaller categories such as Classified, layout is largely not aesthetically pleasing and is jumbled and non-optimal (see navigation, above). TOL would perhaps have done better to have a clear RHN rather than/in conjunction with the long page of sections that have to be searched through to find points of interest and the narrow column, currently centre, would have been better placed on a side. The expected (and delivered) content of TOL is concurrent with Giddings’ (2009) findings and is racially and politically correct. Within this remit there is a good selection of commercial/journalistic stories that are well written, using appropriate multimedia, however, as noted in relation to navigation, the signposting leaves something to be desired. Articles can be very long, but content meets the needs of readers and is appropriate for them, readability is equal to the knowledge of readers and acronyms and jargon are explained. Interactivity on TOL is easily possible as comments and trackbacks are enabled at bottom of articles and blogs, but there appeared to be no forums —even after a Google search— until one appeared in the Sunday edition regarding airline fees. When clicking this link, however, an article comes up, the breadcrumb says ‘travel news’ and the debaters who contributed are all field experts or Times writers. Despite comments being enabled, this is not what one would expect from a reader forum. UGC includes pre- and post-moderated discussion boards, chat rooms, have-your-says, Q&As and blogs with comments enabled (Thurman, 2008), though this last is more interactive than UGC. The TOL does have UGC, but it is often hard to discern, for example, most of the blogs are written by TOL writers. There is some UGC is in the Arts&Ents section in the form of a debate and in the Letters subcategory. How to submit letters for publication is made clear in the appropriate subsection and this form of citizen journalism at least does seem welcomed. 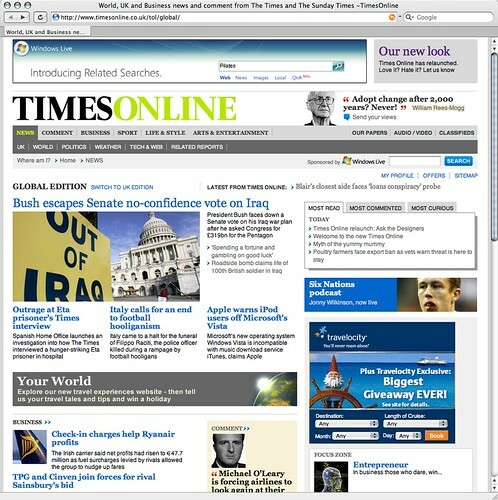 At first glance, The Times Online looks fairly up together and professional. The informational architecture is functional, apart from the jumble of the homepage, but it can be seen that TOL is not updated as regularly as one would expect, nor maintained as thoroughly and there are flaws in their multimedia that render certain aspects of the site unusable. Got sent the Charlie Brooker (guardian) article on the augmented reality of our future and followed another link to the Mercedes Bunz’s ‘seven things you need to know about augmented reality’. Some of the 7 look interesting, particularly No.6. That said, some of the apps available now or soon sound about as appealing as the other apps available on iPhones— like glorified ClipArt. In fairness, I haven’t owned a Smart phone since 2007 and don’t own an iPhone now. Perhaps if I did I would have a different opinion on the whole thing. Although AR hasn’t quite hit the general market yet, there are certainly some appealing applications— and not just for lazy parents and educational purposes. The ‘tour guide’ feature is definitely of interest for anyone travelling for pleasure or business. The AR can tell you what ratings different restaurants and hotel have had, which route to take to get there —or anywhere— and where to park. Pretty useful, but until the omnipotent ‘they’ figure out a way to hardwire our optic nerves to overlay such a display, we’ll probably have to wear ungainly goggles to experience it. Until the advent of such tech, have a read of the following superb books that offer a taste of what could be to come technologically (and socially, but that’s another blog).